She said: “I was looking through the archives of Guiding in Helensburgh and I came across a letter written by the Guider who set up the first company in 1915. The letter was entitled ‘1st Company Helensburgh Guides’, and the author was former Captain Jenny MacCormick, later Mrs MacGowan. As far as I can remember Miss Jenny Bryden asked me in 1913 to assist her in forming the first ever company in Helensburgh. We really started, at our first gathering, with little else than the Guide book to pass round and a sheet with a few names on it. For quite some time, until we appealed to friends, our accommodation and requirements were terribly inadequate and only the enthusiasm of the few girls made us resolve to carry on. As you can imagine it was some considerable time also before we managed to get to full uniforms so no photographs were taken in the first year. Then war came and that was a setback to our progress as the officers were called upon to join W.V.R., Red Cross, etc., eating a lot into the time we should have devoted to our own meetings. However, we did manage to camp, during 1914-15 I think it was. We set out for Whistlefield and had three weeks in glorious weather. All our equipment was hired and pretty awful stuff it turned out to be, but the kind folks of the Garelochside did much to help us out. Each day we had a bathing parade to Portincaple and became great ‘pals’ of Suzy of “Suzy’s Castle” fame. Suzy’s door was never locked — no vandals in those days! — and the girls took her titbits from their rations and got, sometimes, an egg or two in return. Suzy’s cats were numerous, two dogs and several hens, all of which I’m sure slept with her in the “castle” — the half of a fishing smack turned upside down. She was a hawker, but a local worthy who was much respected because of her curious ways and habitation. Also she could talk for ever of the local history and her visitors from all places. The following camp was in Glen Fruin, with what in comparison was grand equipment, but the weather was so torrential that we had to cut our time by a week. The farmer (Mr Niven?) was so sorry for our sodden condition that he cleared a barn and we ‘bunked’ there instead of our leaking tents. Sausages figured a great deal on our menu I remember, and I’m quite sure the watery mince was due to the raindrops adding their uninvited addition, but the girls were well and perfectly happy, unwilling to return home. But we officers were afraid of colds and chills. A girl patrol leader was an outstanding personality and a tremendous help with the younger girls. I feel ashamed that I cannot recall her name. When we had to cut down our own activities the guides worked hard for the war effort. The trek cart was an effort which resulted in quite good achievement. During a fortnight these guides, and they are pretty ‘small fry’, made £20 by collecting bottles and jam jars. By permission they raided the cellars of large houses and out of the dust and cobwebs of countless years they emerged with bottles and jars of weird and wonderful shapes. These they washed and sold to publicans and grocers. The also very young scouts volunteered to help to pull the cart which was heavy at times and the streets hilly. I call to mind that the biggest haul came from a wine cellar owned by a German couple — but during their absence of course. Somewhat ironic! At times again, Wellingtons were donned and sphagnum moss was gathered from the boggy moors till they were dead tired. They also used to gather Foxgloves, care being taken to handle only with stout gloves to guard against the poison. Smaller quantities of the wet moss — used for treating wounds — was taken home by some to dry and pick clean, being later added to the larger collection attended to at the Artillery Stall held by the W.V.R. Many times they became useful and willing “accident cases” for practice by Red Cross and First Aid. I do not think this would be all we were up to in these times, but I just cannot recall. The guides were ‘aye ready’ and most understanding in the early stages that, as a first effort, to found a company they would have to overlook many drawbacks. I am happy to hear that the Company is thriving so well in 1965 and I hope that they may never have to cut their own activities to aid in a future war. I give them the blessing of a guide that was so long ago: May their Union Jacks never be “upside down” and their knots go “granny” on them. The letter will be treasured. Mrs Morrison said that the Girl Guide Association started in 1910. 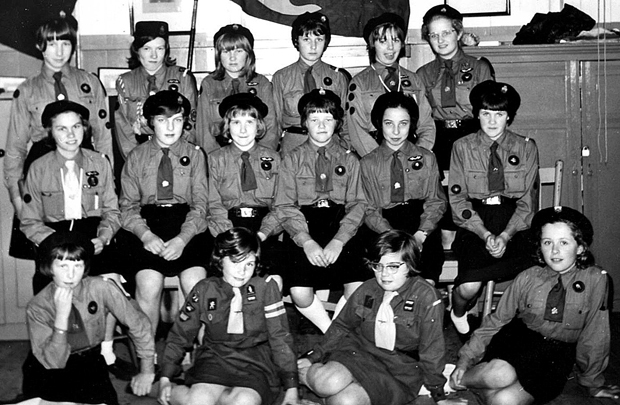 The 1st Helensburgh Guide Company started in 1913 but was not registered until 1915. Initially they met in Church Halls until 1925, when the ground for the Guide Hall in John Street was partly donated and partly self funded. It was opened by Lady Baden Powell. Other activities the girls took part in to aid the War effort included working with the Red Cross, assisting with entertaining evacuees, knitting for the troops, opening their premises for food distribution, and fund raising for the Air Ambulance. The WRVS used the premises weekly for helping evacuee mothers. A celebratory Lunch to mark 50 years of the company was held on May 22 1965. Several of the original members attended, according to the list of signatories in the records. Helensburgh and District Girl Guides marked the organisation’s centenary on October 20 2010. Mrs Morrison added:“Today Guiding is still very active in Helensburgh. “We have two Guide Companies, for girls 10-14 years, four Brownie Packs, for 7-10 year-olds, and three Rainbow Units, for 5-7 years. Also the Trefoil Guild for older former Guides. Pictured during the 1965 celebrations were these members of the 1st Helensburgh company — rear (from left): Helen Davis, Isobel Spalding, Irene Thompson, Janet Cowie, Patricia Harley, Catherine Rennie; middle: Julia Farley, Linda Burns, Mairi Buchanan, Catherine Shanks, Elizabeth Kinloch, Linda Fraser; front: Dorothy Nicholas, Yvonne Campbell, Frances Reavey, Jennifer Simpson.